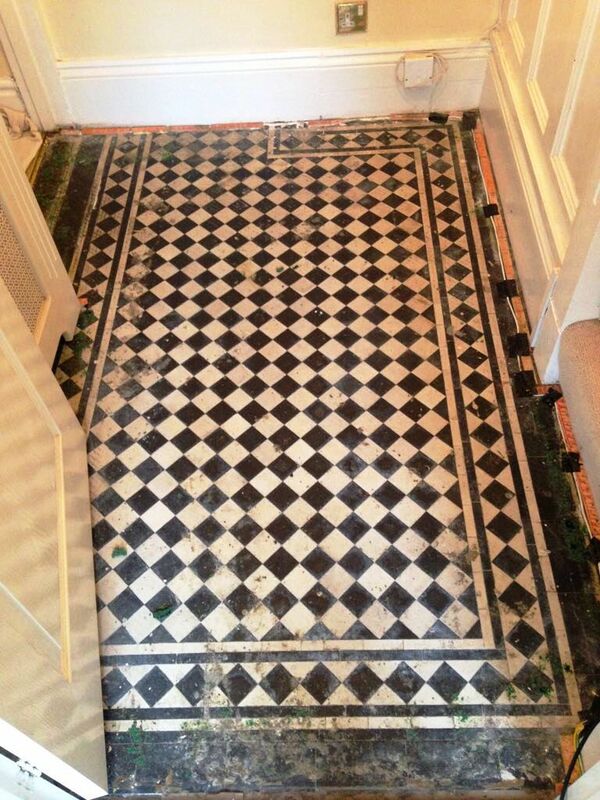 This beautiful black & white Victorian tiled hallway was recently discovered hidden under carpet at a house near Monmouth. As well as the years of grime that had become ingrained in the tile, the carpet had been secured with carpet grippers which had been fixed on top of the tiles and the owner was keen to recruit my help in its restoration. It’s a lovely drive up through the Wye Valley from my base in Caldicot to the town of Monmouth which has a long history that goes back to the Roman times. In fact it’s famous for its “Monnow Bridge” which dates back to medieval times and is the only remaining stone gated bridge of its type left in Britain. Needles to say it has a strong mixture of architecture with many old houses built during Victorian times. The first step in cleaning the floor was to prepare it for cleaning by carefully removing the old carpet grippers and adhesive deposits using a handheld scraper. This was followed by creating a mixture of two powerful cleaning products namely Tile Doctor Remove and Go and NanoTech HBU remover. Remove and Go is a coatings remover designed to strip off old sealers whilst NanoTech HBU is a powerful Heavy Build-Up Remover that uses tiny abrasive particles to clean up tile and stone. The floor was smothered in the cleaning solution and it was allowed to soak into the tile for about twenty minutes before scrubbing it in. It was not an exceptionally large hallway so a lot of hand scrubbing was required to get the floor as clean as possible. The cleaning solution was rinsed off with water and then extracted using a wet vacuum or wet vac as my colleagues often refer to it. To finish off the cleaning process I scrubbed a dilution of Tile Doctor Pro-Clean into the grout lines to get them as clean as possible and then gave the floor a final rinse. I need the floor to be dry before sealing so using the wet vac I extracted as much moisture from the floor as possible. I left the floor to dry completely overnight and returned the next day to finish the floor off with a few coats of sealer. On my arrival I started by taking a few reading with a damp meter to ensure the floor was ready to be sealed. Fortunately by efforts with the Wet Vac the night before had paid off and it confirmed the tiles were dry and ready to be sealed. To do this, I used multiple coats of Tile Doctor Seal and Go which works really well on Victorian Tiles and adds a nice low sheen that brings them up nicely. Naturally the sealer not only improves the way they look it also makes them much easier to clean and will protect them against ingrained dirt and staining. I think you will agree this old floor has been transformed and now has a new lease of life. 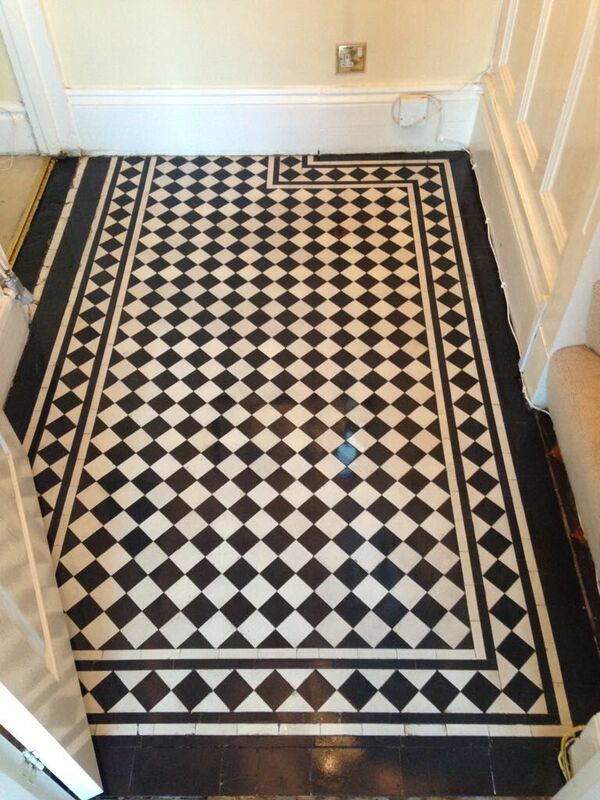 This entry was posted in Victorian Posts and tagged hallway, Monmouth, Monmouth Tile Cleaning, Monmouth Tile Restoration, Monmouth Tile Sealing, monmouthshire, Monnow Bridge, Renovation, restoration, Tiled, victorian, Victorian Hallway Restoration, victorian tile cleaning, Victorian Tile Sealing, Wye Valley by AbzDominise. Bookmark the permalink. There are over 50 Tile Doctors operating throughout the UK and are able to help resolve any problem you have with your tile, stone or grout. Call us today on 0345 512 0122 and ask us to help you with your problem large or small.